Add a custom tab to the Excel Ribbon, using the Custom UI Editor, a free tool. The tab appears when a specific workbook opens, and disappears when the workbook is not active. Requires Excel 2007 or later version. In this tutorial, you'll see how to add a custom tab to the Excel Ribbon, that will be visible when the Order Form workbook is active. There will be buttons on the custom tab, to run the two macros that are in the workbook. To see the steps for adding a custom Ribbon tab in a workbook, please watch this video tutorial. The written instructions are below the video. To see the steps for adding your own icon to a custom Ribbon tab in a workbook, please watch this video tutorial. The written instructions are in the Add a Custom Icon section. We'll use the free tool -- Custom UI Editor to view and edit the Ribbon code. You should download and install the program before starting this tutorial. If you would prefer to create a custom tab your own workbook, write or record at least one macro in the fileS, and make sure that the file is saved as macro-enabled. The first step is to add the Custom UI part in the Custom UI Editor. The Ribbon code will be stored here. 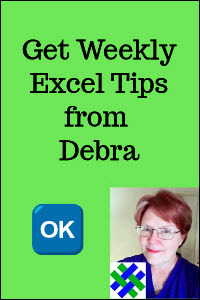 In Excel, close the Order Form workbook, and then close Excel. Click the Open button, then select and open the Order Form file. Click the Insert menu, then click one of the Custom UI parts. The Custom UI part will appear below the file name. To get started, you can let the Custom UI tool create sample code for you. Click on Excel - A Custom Tab. This adds sample code in the code window. Each item has a unique ID, a label, and perhaps other properties, such as an icon and a macro that runs when the button is clicked. For example, here is the code for one of the buttons in the Contoso Tools group. Line breaks were added, to make the code easier to read. The ID -- customButton1 -- is unique. Each ID can only used once in the code. The label -- ConBold -- is the text that will appear on the button in the Ribbon tab. The onAction -- conBoldSub -- is the name of the macro that will run when the button is clicked. 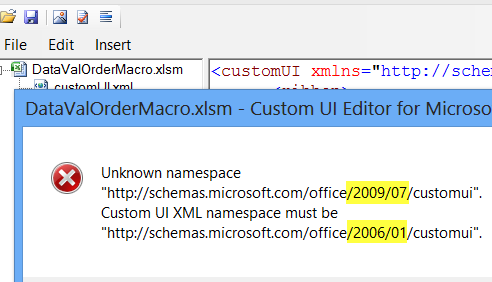 An error message appears, warning that the date in the namespace line must be changed. Click OK, change the date to 2006/01, and click the Validate button again. A different message appears, announcing that the code is well-formed. 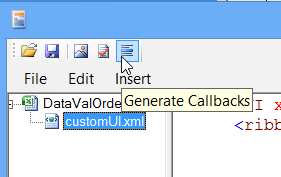 To see the custom tab that the sample code creates, you'll go back to Excel. Open Excel, and open the Order Form file. The new custom tab appears on the Ribbon, after the Home tab. You can see the ConBold button, in the Contoso Tools group, and its Bold image. 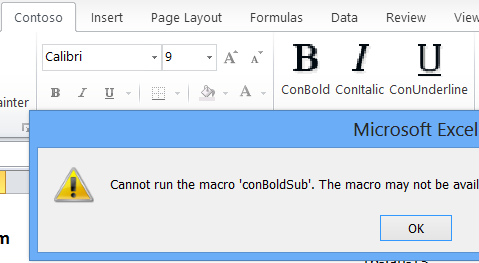 However, the macros that are used in the sample code are not stored in this workbook, so you'll see a warning message if you click the ConBold button. Click OK, to close the message. In a few minutes, you'll adjust the Ribbon code, so it refers to the macros in the sample workbook. Follow these steps, to see the names. In the list, you can see the names of the two macros in this workbook -- ClearDataEntry and PrintOrder. Click Cancel, to close the Macro window. Now that you've seen the sample custom tab, you can adjust the code, so it runs the macros in the Order Form workbook. In the Tab ID line, change the custom tab label from "Contoso" to "Order Form"
Delete the next two lines, with the groups -- GroupClipboard and GroupFont. We don't need these in the custom tab. Also delete the three groups at the end -- GroupEnterDataAlignment, GroupEnterDataNumber and GroupQuickFormatting. 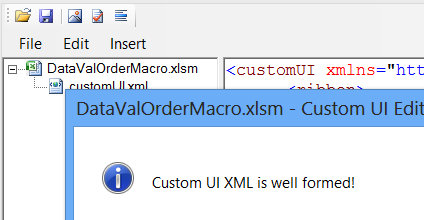 Next, delete the line for CustomButton03 -- you'll only need 2 buttons, to run the 2 macros. Finally, change the group label from Contoso Tools to Order Form Tools. To test your changes, click the Validate button. You should see the message announcing that the code is well-formed. If not, check the code for obvious errors, or close without saving, and then try again. Next, you'll change the button code, to run the macros in the Order Form workbook. Then, validate the code, and save the changes. Note: To see the available icons that you can use as the image Mso, download the Icon Gallery available from the Microsoft website: Office 2007 Icon Gallery. That page has instructions for downloading and using the Gallery. 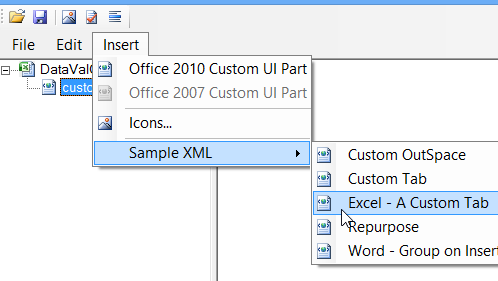 After you have made the Custom UI changes, you can close the Custom UI Editor, and test the file again, in Excel. To see the VBA code, press Alt + F11, and view the code in the modNavigate module. You'll see that each macro needs to have the Ribbon Callback added. Now that everything is set up, you can test the buttons on the Order Form custom tab. To test the custom tab items, click on the Order Form tab, and click one of the buttons. For example, click the Clear button, to see entries cleared from cells B6:D10. Create a new blank workbook, and you'll notice that the custom Order Form tab disappears when the new workbook is active. Switch to the Order Form workbook, and the custom tab will reappear. In addition to using the built-in icons, you can create your own icons for the custom tab. a simple icon was created in MS Paint, using the Arrow drawing tool, and rotated 90°, then filled with blue. The icon is square (100x100) and saved as ribbonhome.png. Another macro, GoOrder, was added to the sample file, to activate the Order Form sheet, and the new button will run that macro. Copy one of the existing Button lines, and paste the copied code. Change the onAction to GoOrder. Click the Insert command on the Custom UI Editor's toolbar. Find and open your custom icon file. Open the Order Form file in Excel. On the Ribbon's Order Form tab, click the Home button. 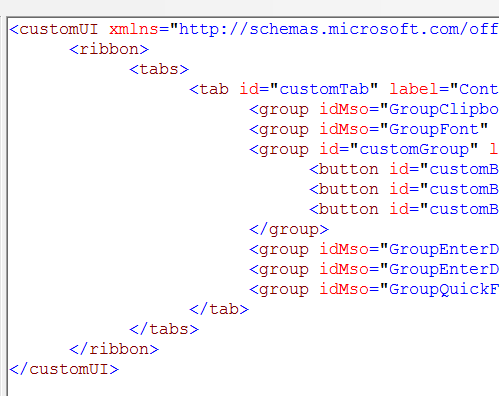 Basic: Download the basic Custom Ribbon Tab sample file -- to follow along with the steps in this tutorial, and add the XML code. The zipped file is in Excel 2007 / 2010 format, and contains macros. Basic Completed: Download the completed version of the Custom Ribbon Tab sample file for this tutorial. The zipped file is in Excel 2007 / 2010 format, and contains macros. 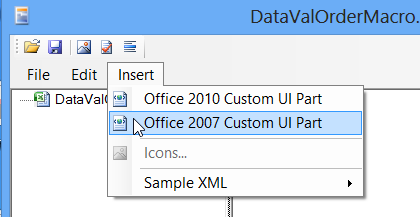 It has both the Office 2007 and Office 2010 Custom UI Parts. Custom Icon: For the custom icon sample file, click here to download the workbook. The zipped file is in Excel 2007 / 2010 format, and contains macros. It also contains the icon image for the custom tab.